Dozens of elderly South Koreans have crossed the border into the North to meet relatives for the first time since they were driven apart during the 1950-53 Korean war. 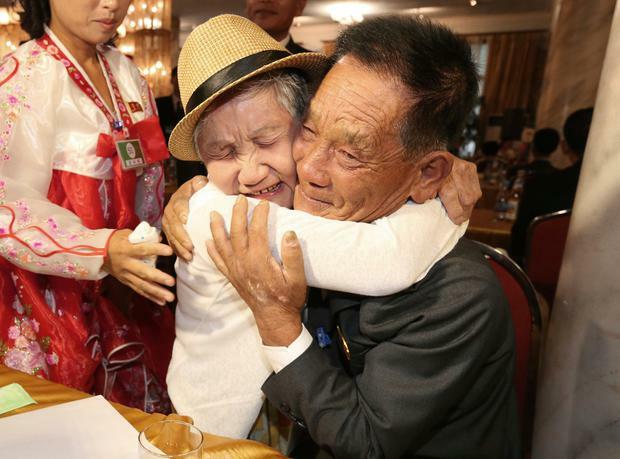 There were emotional scenes as the reunions took place in the North’s Diamond Resort, as the rival Koreas step up reconciliation efforts. One 92-year-old South Korean woman wept and stroked the wrinkled cheeks of her 71-year-old North Korean son. Hugging the woman he’d last seen as a child, Mr Ri showed his mother a photo of her late husband, who had stayed behind in the North with him as a boy. The week-long event is the first of its kind in nearly three years, and was arranged as part of diplomatic efforts to resolve a stand-off over North Korea’s nuclear ambitions. Most of the participants in the reunions are in their 70s or older and are eager to see their loved ones once more before they die. Most have had no word on whether their relatives are still alive because they are not allowed to visit each other across the border or even exchange letters, phone calls or emails. During Monday’s meetings, many elderly Koreans held each other’s hands and wiped away tears while asking how their relatives had lived. They showed photos of family members who were not able to attend the meetings. Han Shin-ja, a 99-year-old South Korean woman, was at a loss for words after she reunited with her two North Korean daughters, both in their early 70s. Before this week’s reunions, nearly 20,000 people had participated in 20 rounds of face-to-face reunions since 2000. Another 3,700 exchanged video messages with their North Korean relatives. None of them had a second chance to see or talk with their relatives.